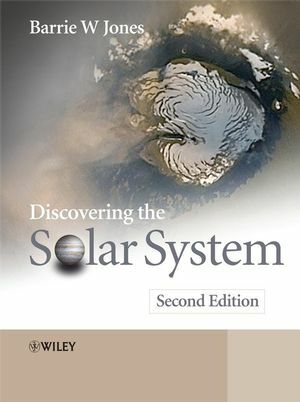 Discovering the Solar System, Second Edition covers the Sun, the planets, their satellites and the host of smaller bodies that orbit the Sun. This book offers a comprehensive introduction to the subject for science students, and examines the discovery, investigation and modelling of these bodies. Following a thematic approach, chapters cover interiors, surfaces and the atmospheres of major bodies, including the Earth. The book starts with an overview of the Solar System and its origin, and then takes a look at small bodies, such as asteroids, comets and meteorites. Includes full coverage of each planet, as well as the moon, Europa and Titan. The Second Edition includes new material on exoplanetary systems, and a general update throughout. Contains ‘stop and think’ questions embedded in the text to aid understanding, along with questions at the end of major sections. Answers are provided at the end of the book. Professor Barrie W. Jones, Professor of Astronomy, The Open University, Milton Keynes, UK. Has been awarded the David Wynn-Williams Prize for services to Astrobiology, by the Astrobiology Society of Britain in 2006. Preface and Study Guide to the First Edition. 1 The Sun and its Family. 1.1.4 The Solar Neutrino Problem. 1.2 The Sun’s Family – A Brief Introduction. 1.2.1 The Terrestrial Planets and the Asteroids. 1.3 Chemical Elements in the Solar System. 1.4 Orbits of Solar System Bodies. 1.4.1 Kepler’s Laws of Planetary Motion. 1.4.3 Asteroids and the Titius–Bode Rule. 1.4.4 A Theory of Orbits. 1.4.7 The Orbit of Mercury. 1.5.1 Precession of the Rotation Axis. 1.6 The View from the Earth. 1.6.2 Solar and Lunar Eclipses. 1.7 Summary of Chapter 1. 2 The Origin of the Solar System. 2.2.1 Angular Momentum in the Solar System. 2.2.2 The Evaporation and Condensation of Dust in the Solar Nebula. 2.2.3 From Dust to Planetesimals. 2.2.4 From Planetesimals to Planets in the Inner Solar System. 2.2.5 From Planetesimals to Planets in the Outer Solar System. 2.2.6 The Origin of the Oort Cloud, the E–K Belt, and Pluto. 2.3 Formation of the Satellites and Rings of the Giant Planets. 2.3.1 Formation of the Satellites of the Giant Planets. 2.3.2 Formation and Evolution of the Rings of the Giant Planets. 2.4 Successes and Shortcomings of Solar Nebular Theories. 2.5 Summary of Chapter 2. 3 Small Bodies in the Solar System. 3.1.1 Asteroid Orbits in the Asteroid Belt. 3.1.2 Asteroid Orbits Outside the Asteroid Belt. 3.1.4 Asteroid Shapes and Surface Features. 3.1.5 Asteroid Masses, Densities, and Overall Composition. 3.1.6 Asteroid Classes and Surface Composition. 3.2 Comets and Their Sources. 3.2.1 The Orbits of Comets. 3.2.2 The Coma, Hydrogen Cloud, and Tails of a Comet. 3.2.4 The Death of Comets. 3.2.5 The Sources of Comets. 3.3.1 Meteors, Meteorites, and Micrometeorites. 3.3.2 The Structure and Composition of Meteorites. 3.3.4 The Sources of Meteorites. 3.3.5 The Sources of Micrometeorites. 3.4 Summary of Chapter 3. 4 Interiors of Planets and Satellites: The Observational and Theoretical Basis. 4.1.2 Radial Variations of Density: Gravitational Coefficients. 4.1.3 Radial Variations of Density: The Polar Moment of Inertia. 4.1.5 Local Mass Distribution, and Isostasy. 4.3.2 Planetary Seismic Wave Data. 4.4 Composition and Properties of Accessible Materials. 4.4.3 Equations of State, and Phase Diagrams. 4.5 Energy Sources, Energy Losses, and Interior Temperatures. 4.5.2 Energy Losses and Transfers. 4.5.3 Observational Indicators of Interior Temperatures. 4.6 Summary of Chapter 4. 5 Interiors of Planets and Satellites: Models of Individual Bodies. 5.2 Planetary Satellites, Pluto, EKOs. 5.2.2 Large Icy-Rocky Bodies: Titan, Triton, Pluto, and EKOs. 5.2.3 The Galilean Satellites of Jupiter. 5.5 Summary of Chapter 5. 6 Surfaces of Planets and Satellites: Methods and Processes. 6.1 Some Methods of Investigating Surfaces. 6.1.1 Surface Mapping in Two and Three Dimensions. 6.1.2 Analysis of Electromagnetic Radiation Reflected or Emitted by a Surface. 6.2 Processes that Produce the Surfaces of Planetary Bodies. 6.2.1 Differentiation, Melting, Fractional Crystallisation, and Partial Melting. 6.2.2 Volcanism and Magmatic Processes. 6.2.7 Formation of Sedimentary Rocks. 6.2.8 Formation of Metamorphic Rocks. 6.3 Summary of Chapter 6. 7 Surfaces of Planets and Satellites: Weakly Active Surfaces. 7.1.1 Impact Basins and Maria. 7.1.2 The Nature of the Mare Infill. 7.1.4 Tectonic Features; Gradation and Weathering. 7.1.6 Crustal and Mantle Materials. 7.1.7 Radiometric Dating of Lunar Events. 7.2.2 The Highlands and Plains of Mercury. 7.2.4 Other Surface Features on Mercury. 7.2.5 The Evolution of Mercury. 7.3.7 Observations at the Martian Surface. 7.3.9 The Evolution of Mars. 7.5 Summary of Chapter 7. 8 Surfaces of Planets and Satellites: Active Surfaces. 8.1.3 The Success of Plate Tectonics. 8.1.4 The Causes of Plate Motion. 8.1.5 The Evolution of the Earth. 8.2.3 Impact Craters and Possible Global Resurfacing. 8.2.5 Surface Analyses and Surface Images. 8.2.7 Tectonic and Volcanic Processes. 8.2.9 The Evolution of Venus. 8.4 Icy Surfaces: Europa, Titan, Enceladus, Triton. 8.5 Summary of Chapter 8. 9 Atmospheres of Planets and Satellites: General Considerations. 9.1 Methods of Studying Atmospheres. 9.2 General Properties and Processes in Planetary Atmospheres. 9.2.1 Global Energy Gains and Losses. 9.2.2 Pressure, Density, and Temperature Versus Altitude. 9.2.3 Cloud Formation and Precipitation. 9.2.5 Atmospheric Reservoirs, Gains, and Losses. 9.3 Summary of Chapter 9. 10 Atmospheres of Rocky and Icy–Rocky Bodies. 10.1 The Atmosphere of the Earth. 10.1.1 Vertical Structure; Heating and Cooling. 10.1.2 Atmospheric Reservoirs, Gains, and Losses. 10.2 The Atmosphere of Mars. 10.2.1 Vertical structure; heating and cooling. 10.2.2 Atmospheric Reservoirs, Gains, and Losses. 10.3 The Atmosphere of Venus. 10.3.1 Vertical structure; heating and cooling. 10.3.2 Atmospheric Reservoirs, Gains, and Losses. 10.4 Volatile Inventories for Venus, the Earth, and Mars. 10.5 The Origin of Terrestrial Atmospheres. 10.5.2 Volatile Acquisition During Planet Formation. 10.6 Evolution of Terrestrial Atmospheres, and Climate Change. 10.7 Mercury and the Moon. 10.8.3 The Origin and Evolution of the Atmospheres of Icy-Rocky Bodies. 10.9 Summary of Chapter 10. 11 Atmospheres of the Giant Planets. 11.1 The Atmospheres of Jupiter and Saturn Today. 11.2 The Atmospheres of Uranus and Neptune Today. 11.3 The Origin of the Giant Planets—A Second Look. 11.4 Summary of Chapter 11.